The audiobook version of Bound, produced by Tantor Media and read by Paul Boahmer and Justine Eyre, is now available! Paul Boehmer graduated with a master’s degree and was cast as Hamlet by the very stage actor who inspired his career path. He has worked on Broadway and extensively in regional theater, and has been cast in various roles in many episodes of Star Trek. Paul’s love of literature and learning led him by nature to his work as a narrator for audiobooks, his latest endeavour. Justine Eyre is a classically trained actress who has narrated over two hundred audiobooks. With a prestigious Audie Award and four AudioFile Earphones Awards under her belt, Justine is multilingual and is known for her great facility with accents. Her recent television credits include Two and a Half Men and Mad Men. 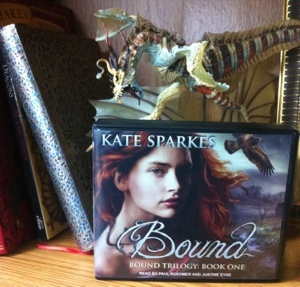 Amazon*, Barnes & Noble, iTunes (search “Kate Sparkes Bound”), Audible.com. *Affiliate link–purchasing through this link costs you nothing extra, but provides a little extra money for the author.